Play only if you control a Lord or Lady character. Challenges Action: Kneel your faction card to choose a character with printed cost X or lower controlled by an opponent, and return it to its owner's hand. This card is extremely useful in any Lannister deck that is leveraging an economic advantage. This is a likely scenario with cards such as Tyrion Lannister and Tywin Lannister making frequent appearances. The optimal use of the card is to remove a character from a challenge. For example, this may help generate an unopposed challenge against The Wall, or prevent the opponent from triggering a likely Put to the Sword or similar. 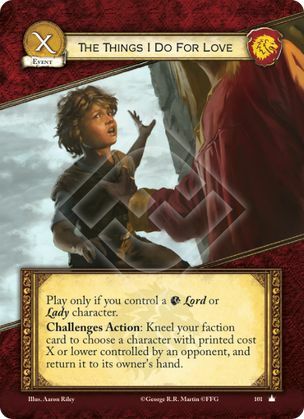 Combined with cards like Cersei Lannister, there is a good chance of the character being subsequently discarded from the opponent’s hand. If allied with House Baratheon, follow up with Seen In Flames to ensure an unpopular characters ends up in the discard pile! The printed value is always the value that is physically printed on the card - regardless of any modifiers (RR p16, "Printed"). In the case of a card with cost "X", the printed cost is the letter X - regardless of what the actual cost paid was. The letter X has its own entry (RR p.23) which clarifies that when not specified by a card ability or player choice, the letter X is treated by the game as 0 (rather than, for instance, "null"). Since player choice or card ability cannot influence the "printed" value, the rules tell us that the printed value of X is equal to 0. In short, you can cancel an event with printed cost X (including another The Hand's Judgement) with "The Hand's Judgement (Core)" at no cost, regardless of how much gold was spent as part of the cost of the event you are cancelling.